This track plays whenever you're talking to the Darlok in Master of Orion II, a race of shape-shifters which makes them excellent spies. Not only do they get a +20 bonus on spy rolls they also have "stealthy ships" which means they are invisible to long range sensors (i.e. you can't see their ships approaching your colonies on the star map). And that's it: the Darlok only receive two bonuses, but they have no disadvantages either. The theme for the Darlok is actually one of my favourites in the game, probably because it's got a sneaky, spy vibe to it, as you'd expect. 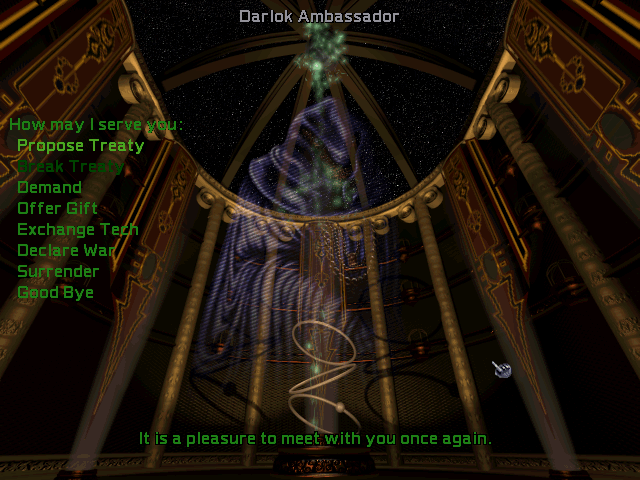 Never trust a Darlok, especially if you have me playing as them (as my poor Trilarian allies found out too late).